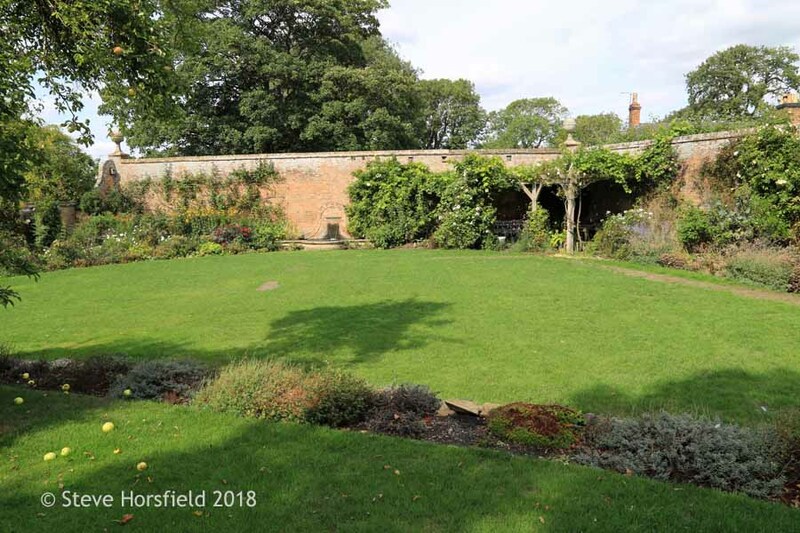 Well, the first and only time that I participated in the famous Garden Bloggers' Bloom Day meme hosted by Carol from May Dreams Gardens on every fifteenth of the month was last year in March. The main reason why I didn't participate more often in this great meme is that for time reasons in general, I have trouble to get a post out on a specific day. This month the fifteenth falls on the Easter weekend on Saturday though, and therefore I have time to blog and thought I will give it another go. So yesterday I ventured out with my camera into the garden to see what was blooming. In the middle of April my roses usually are reaching their spring flush peak, but this year they are a little bit delayed. I feel the same goes for many perennials, but there are still plenty of blooms of any kind in the garden right now. Unfortunately, when I was done shooting in the front yard and got into the backyard a fierce wind was flaring up and I couldn't take any more photos, but let's see what I got. In the front yard, my two 'Climbing Iceberg' roses are in full bloom. Here you see the one on the left side of the garage. In the foreground, salvia 'Amistad', which is new to the garden, is showing off her beautiful large dark purple flowers, which emerge from almost black bracts. All in all a very showy salvia, that is visited by hummingbirds, which is lovely, but I have a feeling that it wants to grow a little bit bigger than I would like. Looking at the left side of the walkway to the front door. In the foreground rosa 'Old Fashioned Girl', in the middle salvia 'Mystic Spires Blue' has just started to flower, and in the background to the left, you see the same rosa 'Climbing Iceberg' that I showed in my opening photo of this post. Salvia 'Mystic Spires Blue', here a close-up, is one of my favorite salvias. It stays mannerly in terms of its size, which is a big plus for a small garden and it blooms very prolifically once it is in full swing over a long period of time. ...which is growing in a container near the front door. ...which are absolutely exquisite at this time of the year. Here a close-up. Walking back to the front of the house my other rosa 'Climbing Iceberg' comes into view. 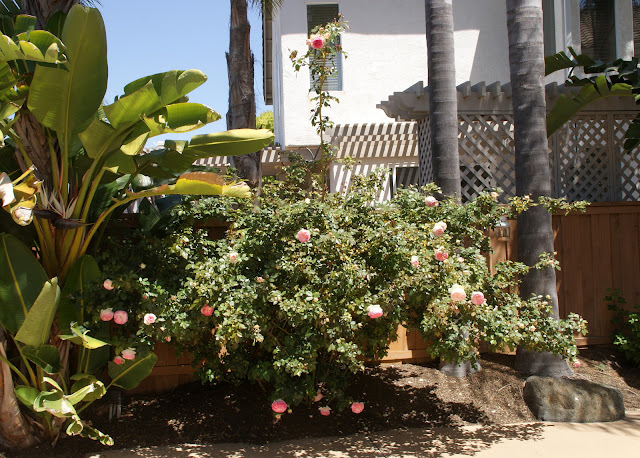 These two roses have really done fabulously this spring and are completely smothered in blooms. 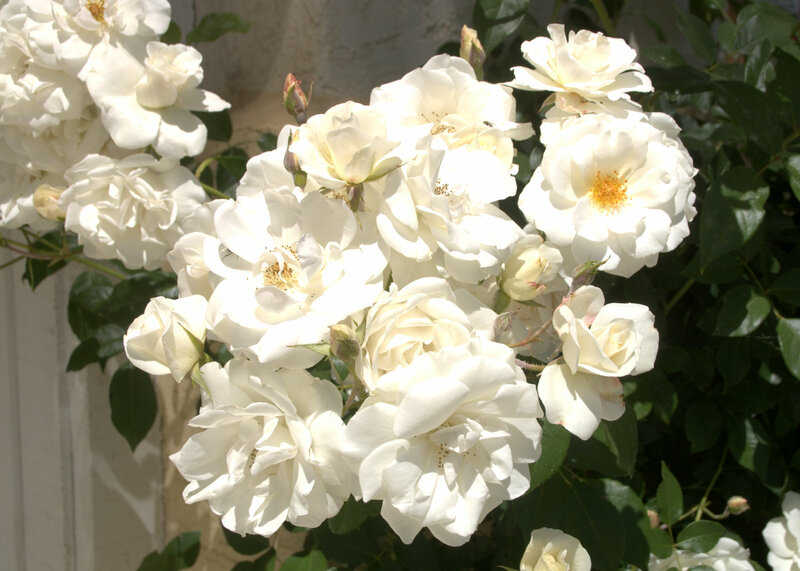 ...are also offering food for the pollinators because they show their stamens, which many of the modern Hybrid Tea roses don't. Also in the front yard, one of my favorite penstemons 'Pinacolada Violet' is blooming. It is part of a relatively new series of penstemons that have the advantage of an earlier bloom time and a well-branched compact growth habit. One of my most beloved roses in the front yard is 'Charles Darwin'. If you follow my blog for a while you know that yellow is usually not my favorite color, but I have fallen for this more muted, pale tone. The flowers of 'Charles Darwin' are large and they come with a very delicious and strong fragrance. Going into the back yard we pass by rosa 'Pierre de Ronsard', which is becoming bigger and bigger each year. Do you see how tall the newest cane from this year in the middle of the rose is? The rose has just come into bloom over the last days. Here is a close-up of the top flower spray of the longest cane reaching for the sky. The very large and full blooms are just stunning and I am looking particularly forward to them each year. I think this is one of the best roses that the house of Meilland has introduced so far. Ajuga reptans 'Catlin's Giant' is in full bloom right now and showing off its wonderful shade of clear blue flowers. I am amazed how well this plant is doing in my garden. I am not coddling it, as a matter of fact, it is growing in a very difficult shady position and yet it is able to bloom so profusely. For that reason, I intend to spread it around to other areas in the garden this year. I will conclude with a shot of rosa 'Grandmother's Hat', which is at her spring flush peak right now. 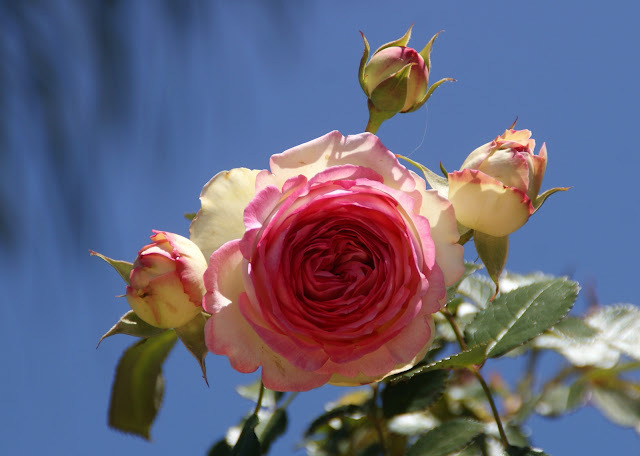 If you want to see more close up photos of her beautiful and fragrant blooms or other roses flowering in my garden, please click on my March Roses post. That was it from my garden for Garden Bloggers' Bloom Day, please hop over to Carol at May Gardens Dreams after you are done reading this post and see what is blooming in her and other bloggers' gardens around the world on this lovely day. One more thing: My blog has recently passed the 500.000 pageview mark! Truly a little reason to celebrate! Thank you so much for coming here to visit and comment, please know that I really appreciate it. This blog wouldn't be what it is without YOU! Wishing you a very happy and sunny Easter! Really nice to see your fantastic roses. Our first one this year started flowering. It was China Old Blush and really should not be out yet. Must be global warming! 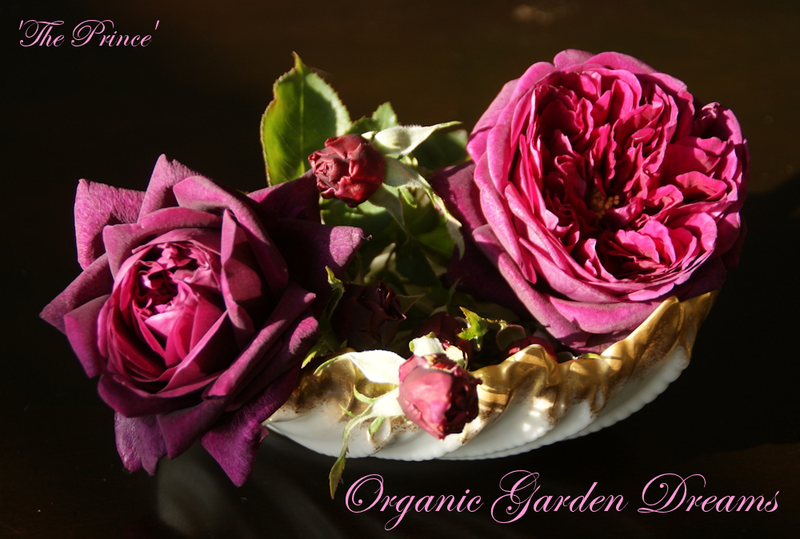 Hi Steve, welcome to my blog and thanks for your nice words about my roses! I know you garden in England, so I am very surprised to read that rosa 'Old Blush' is already flowering for you. I think that is really early! But I guess nobody is complaining ;-)! your roses look great! I absolutely love your Captain Christy rose and your Grandmother´s Hat rose. Enjoy the Easter weekend! ich finde Deinen Beitrag für den Garten Bloggers' Bloom Tag sehr gelungen und gratuliere zu den vielen Zugriffen auf Deinen Blog! Hi Ingrid, nice to see you leaving a comment on my blog, again! I am glad that you like my Garden Bloggers' Bloom Day entry and thanks for your congratulations to my blog reaching 500.000 pageviews. That is truly a milestone in my blog history :-)! I'm sorry the wind interfered with your photo-taking. We've had wind problems here too but I take my photos a few here and a few there leading up to Bloom Day to circumvent weather problems. In any case, you found plenty to share! Your roses are splendid, of course. I'm particularly impressed by just how floriferous 'Grandmother's Hat' is. 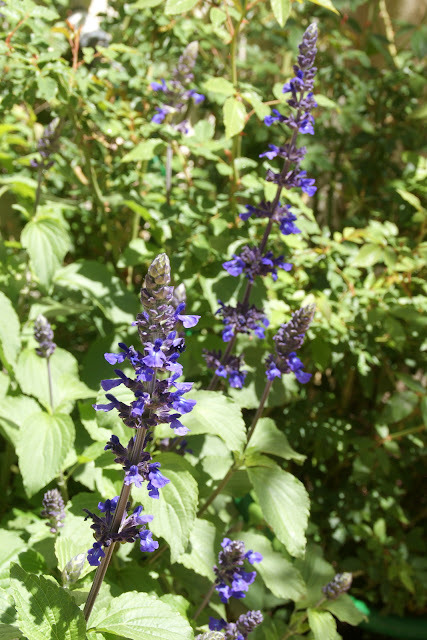 Does Salvia 'Amistad' survive year-to-year in your garden? I've tried growing it a few times but it dies out every year by summer's end here. Kris, in the case I make it to attend Garden Bloggers' Bloom Day again, I will also start to take photos a few days prior to the fifteenth of the month so that my post will not be so dependened on the actual weather conditions the day before the post is due. I only have salvia 'Amistad' since a couple of weeks, so I am not able to answer your question yet, but I expect it do be a perennial here. I find it odd that it dies each year at the end of summer in your garden. I often have guessed that maybe your micro climate is hotter than mine and maybe this in another indication that this is the true. Happy Bloom Day, Christina! I can feel that California sunshine in your photos. Love it! And your husband is a great photographer, too! Hello Cristina. Your roses are lovely, and I especially like seeing Pierre aka Eden looking so healthy and robust.I expect a very bad year for blackspot here and this rose will be completely defoliated in May if all goes as usual. Happy Bloomday ! ks, unfortunately my 'Pierre de Ronsard' isn't all that healthy this year. The rose is so big that the photo doesn't show it, but there is rust one some leaves and by today it has become worse. As great as all the rain was that we were having this winter my roses have responded with a lot more disease than in previous years. I am curious if the rose can shake off the rust as the weather warm up reliably also at night. Your garden looks beautiful. Lovely roses, and the climbing Iceberg is so pretty. We got some snow and had a couple of really cold nights, so it´s far from the lovely garden view you have. I rarely manage to make the Bloom Day posts for the exact reasons you stated. 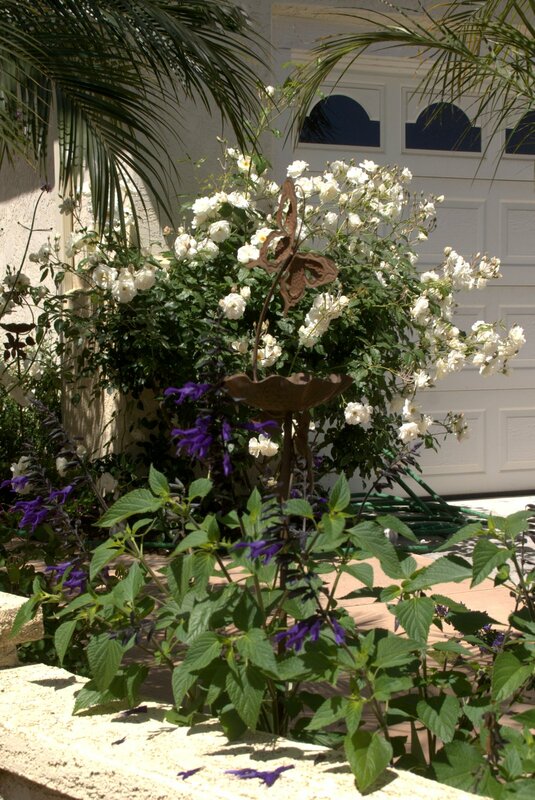 Your roses, salvias and penstemon are among my favorites and yours looks great. I always hesitate to put in white roses but the Climbing Iceburg really makes me want to try it. I have grown the shrub variety and it was fantastic. Phillip, white is my favorite color, I admit that I am partial to that, I wonder why you are hesitating to plant white roses in your garden. 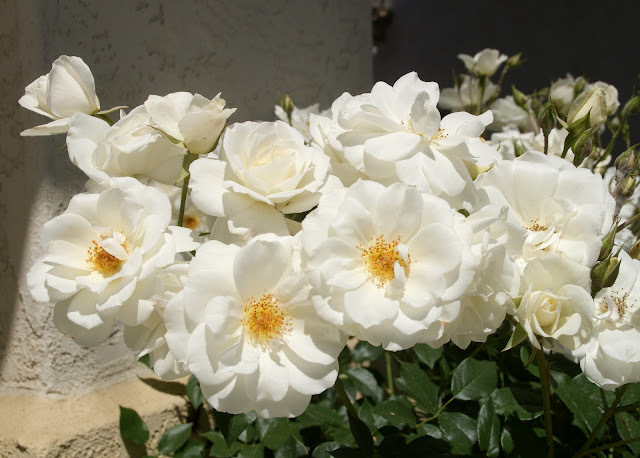 I think there are many advantages to white roses, besides that they are pretty, I feel they really lighten things up in the garden. Besides that they are good mediators planted between other colors, they kind of make sure that everyone gets along :-)! Liebe Christina, zu allererst möchte Dir Frohe Ostern wünschen. Hoffentlich war der Osterhase fleißig. Dein Rosengarten ist wirklich ein Traum. Bei uns ist das Wetter derzeit eine Katastrophe, es ist sogar Frost angsagt. Wenn der wirklich kommt, ist vieles wieder kaputt. Wegen Pinterest: Das ist doch überhaupt kein Problem. Wenn Du mal mitmachen willst, gib einfach Bescheid. Kathrin, thanks for your kind words about my rose garden! So very sorry that the weather has been so bad in Austria. Late frost in spring can be very damaging to plants, so I hope the weather forecast didn't become true or if it did freeze in your area that it didn't hit your plants too badly. Beautiful. I love your Charles Darwin. The 'Charles Darwin' is a lovely delicate color. Salvia 'Amistad' does get quite large, but the purple is such a perfect purple. Your garden looks wonderful, Christina. I enjoyed seeing it. Your flowers are just stunning, especially your Iceburg and the Darwin! Thanks for sharing it with us at the DI & DI Link Party. 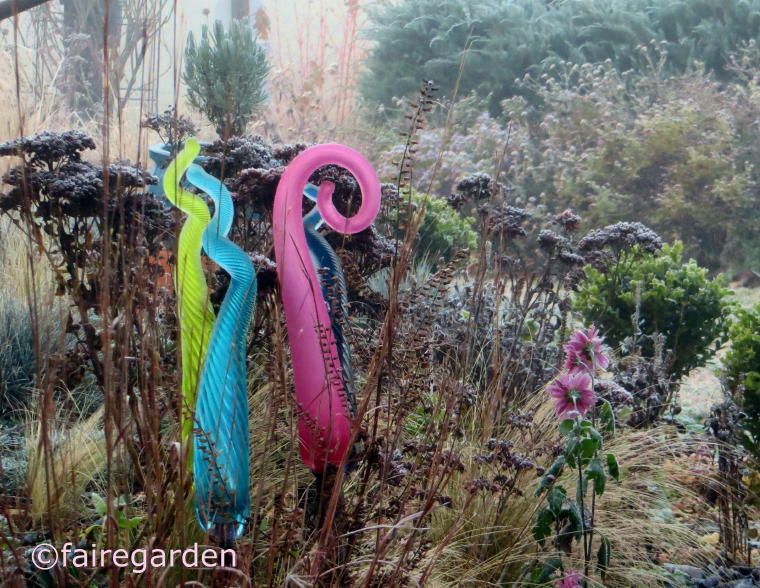 So enjoyed seeing your garden today. The Martha Washington geranium is something I've never seen before. And the rose is breathtakingly beautiful. Thanks so much for sharing. 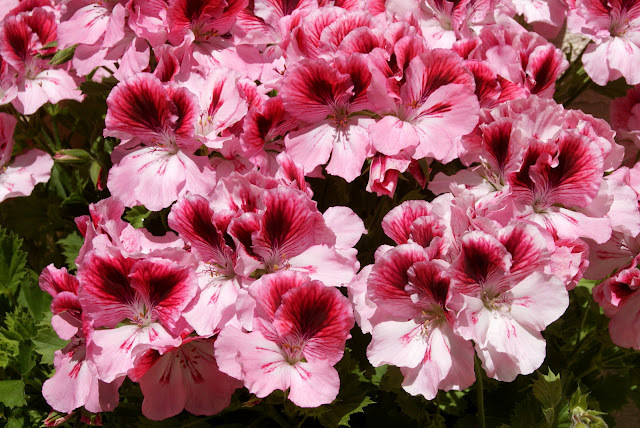 Your geranium is really awesome! I like your beautiful white rose. Your roses are gorgeous. 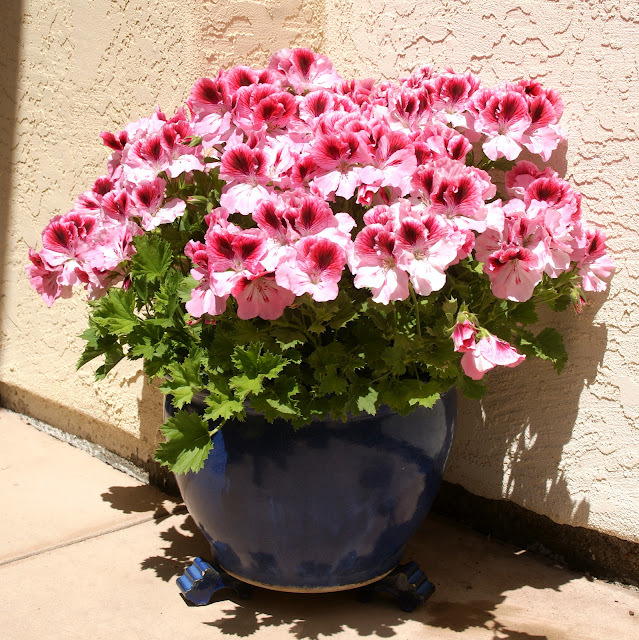 Love the geraniums! 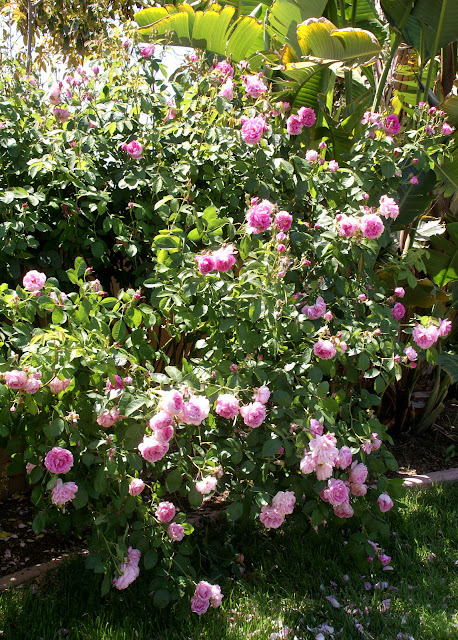 I enjoyed seeing your blooms, especially your fabulous roses. 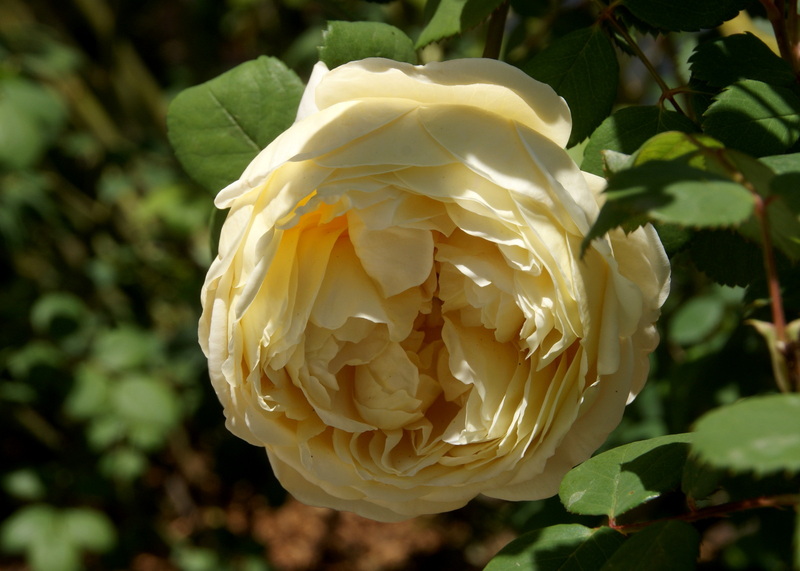 I love 'The Prince', Rosa 'Captain Christy', 'Charles Darwin', and 'Pierre de Ronsard'. Really, I could name others - they are all great! Oh !...chère Christina, je suis admirative de ce beau rosier Iceberg qui trône devant ta maison. sa floraison exquise est vraiment fabuleuse. En visitant ton blog, j'ai déjà un avant goût de mes rosiers qui ne seront en fleurs qu'à la fin du mois prochain. Je connais bien la sauge Mystic Spires Blue, je l'ai apprivoisée quelques années plus tôt et j'ai apprécier sa floraison estivale. I am so glad I've stopped by!! Another fabulous post!! Gorgeous flowers!! Thanks for sharing!Hugs,Maristella. Marvelous photos of all these beuatiful flowers and blossom. 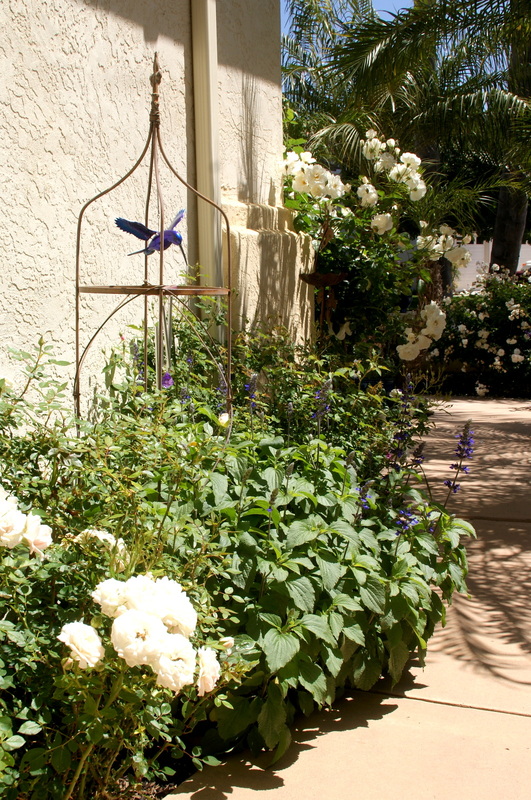 Thank you for sharing your beautiful garden on our Share Your Style Party. Your roses are spectacular. I adore roses. It's very difficult to keep the deer from eating mine but I do have a Fire Cracker climbing rose that is doing pretty well and is in a place the deer have a hard time getting to. Captain Christy may be a weakling but it's one beautiful flower. You certainly have a green thumb and your garden is gorgeous. Thank you for sharing with us this week at Celebrate Your Story, and have a great weekend. Your garden is always gorgeous! I have not heard of that Salvia in the first photo. It sounds wonderful. I have always loved Iceberg roses and Martha Washington Geraniums. Need to plant some this year! Thanks for sharing with SYC. Wow, how could I missed your beautiful post? It's so lovely to see the white's and blue's in your garden. Your roses are stunning. 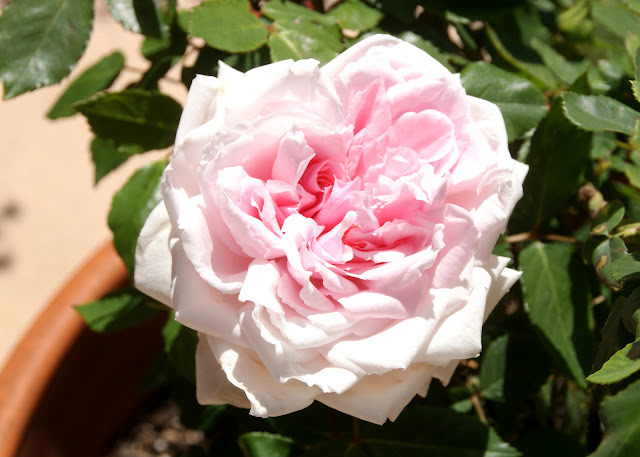 Pierre de Ronsard is beautiful and healthy rose, also in my garden. Your Climbing Iceberg roses are so beautiful. I'm thinking of adding some to my yard this year! The purple plants around it really make it pop! 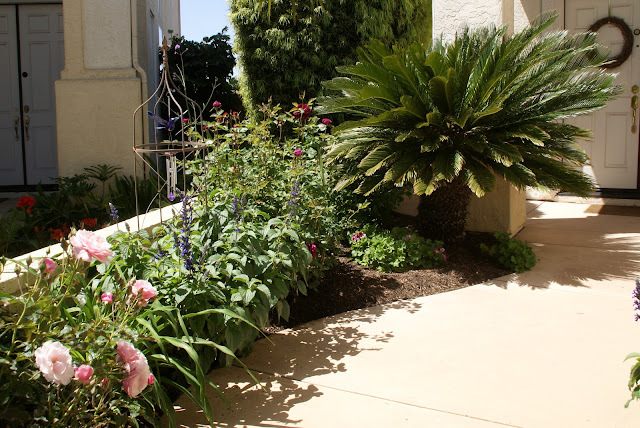 You have such a lovely garden :) Thank you so much for sharing with us at Dishing It & Digging It & congratulations on being featured this week!